Rally car champion Colin McRae has been blamed for causing the helicopter crash in which he died along with his five-year-old son and two family friends. A fatal accident inquiry found the crash, near his family home in Lanark in 2007, happened because he carried out unnecessary low-level manoeuvres. It also found that Mr McRae's flying was "imprudent" and "unreasonable". In a statement, the McRae family said they "still believe we will never know what caused the crash". 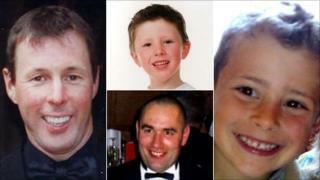 Mr McRae, 39, his five-year-old son Johnny, the boy's six-year-old friend Ben Porcelli and Graeme Duncan, 37, all died when the aircraft came down near the McRae family home in Lanark on 15 September 2007 as they flew home from a trip to see a friend. The inquiry had heard from Karen and Mark Porcelli, the parents of Ben, who said they did not give Mr McRae permission to take their son in the helicopter. Sheriff Nikola Stewart, who heard the inquiry over 16 days at Lanark Sheriff Court, concluded that the deaths could have been avoided if Mr McRae had not engaged in low-level flying "when it was unnecessary and unsafe to do so". In her written determination, the sheriff concluded: "The deaths and the accident resulting in the deaths might have been avoided had Mr McRae not flown his helicopter into the Mouse Valley. "Such a precaution would have been entirely reasonable. There was no necessity to enter the Mouse Valley. There were no operational or logistical reasons to enter the Mouse Valley. "Mr McRae chose to fly the helicopter into the valley. For a private pilot such as Mr McRae, lacking the necessary training, experience or requirement to do so, embarking upon such demanding, low-level flying in such difficult terrain, was imprudent, unreasonable and contrary to the principles of good airmanship." The ruling states that the accident happened when, due to an "unknown occurrence", the aircraft deviated from its intended flight path and crashed into trees lining the side of Mouse Valley. The aircraft was in powered flight at the time of the crash and Mr McRae had attempted to recover from that unknown incident. These attempts, the sheriff said, were unsuccessful because of the position and speed of the helicopter within Mouse Valley and the ensuing restrictions on opportunities to land the helicopter or fly it to safety. Such options would have been available to him had he "adhered to rules of good airmanship and desisted from flying in the valley at low height and high speed", she said. The sheriff stated: "It would have been a reasonable precaution to refrain from flying helicopter G-CBHL into Mouse Valley wherein the pilot engaged in low-level flying when it was unnecessary and unsafe for him to do so, and whilst carrying passengers on board." As part of the hearing, the sheriff and lawyers involved in the case visited the woods where the Eurocopter Squirrel aircraft crashed. One of the crash victims, Mr Duncan, filmed much of the outbound and return flights on his personal camcorder and some of the footage was recovered and included in the inquiry hearings. Sheriff Stewart said the footage indicated that the helicopter was being flown "at unnecessarily low heights". "He (Mr McRae) undertook significant manoeuvring at low level and the helicopter seems to have encountered significant g-loading as a result, to the evident enjoyment of his passengers. "The episodes of extremely low-level flying and the excessive manoeuvre parameters, particularly the descent into the valley by Larkhall, all as captured on the video recording, are indicative of an aircraft being flown imprudently, without due regard to the principles of good airmanship and in such a way that normal safety margins would be reduced." To fly an aircraft in the UK, it is necessary to hold a pilot's licence and a valid medical certificate, and to have the licence validated with the type of aircraft to be flown. Sheriff Stewart found that Mr McRae did not hold a valid flying licence or a valid "rating" for the Eurocopter Squirrel helicopter. "He was, accordingly, in breach of article 26 of the Air Navigation Order 2005 when he flew his helicopter on September 15 2007 and should not have flown that machine at that time," she said. The sheriff's findings go further than an Air Accidents Investigation Branch (AAIB) report, published in February 2009, which found no cause could be positively determined into the tragedy. In a statement, Mr McRae's family said they still believed the cause of the crash could not be determined. His father, Jimmy McRae, said: "We still believe we will never know what caused the crash but we were never in any doubt as to Colin's prowess as a fine pilot. "Everybody knows from Colin's rallying career that safety is always an issue and that his reactions and eye and hand co-ordination were world-class." He said his family had wanted the inquiry to recommend that private aircraft should be fitted with a flight data recorder. He said: "Had a flight recorder been fitted to the aircraft, it may have been possible to determine what occurred in the final seconds of the flight and what actually caused the helicopter to crash. "This would prevent uncertainty as to the cause of the crash and allow lessons to be learned from tragic accidents such as this." Mr McRae said he hoped the family would be able to "move forward" following the findings. The McRae family's solicitor, Peter Watson, added: "Although Colin's licence was out-of-date, this played no contributory factor whatsoever to the accident."